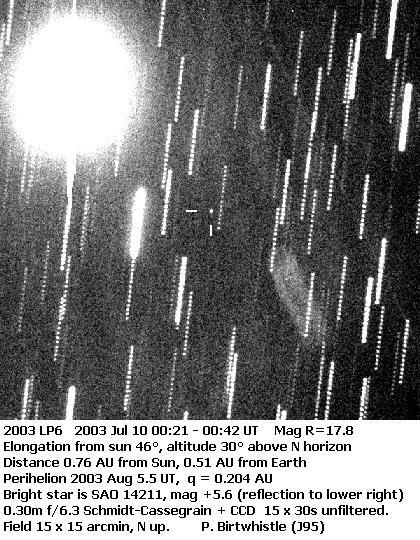 2003 LP6 was discovered by LINEAR on 2003 June 12 and following posting on the NEOCP was found to be an Apollo asteroid with an interesting orbit, originally published on MPEC 2003-L53. The perihelion distance is only 0.2 AU, aphelion 3.3 AU, the period 2.3 years and the inclination is 44°. It is relatively large for a new discovery these days with an estimated diameter of 2-4 Km. Although it never comes very close to Earth it should be able to be picked up on most returns, check out the JPL orbit viewer for the geometry. Indeed it may be able to be followed with large telescopes even at aphelion at around mag +22.